Volunteers who dedicate their time to local sight loss charity, Beacon Centre for the Blind, have been presented with the prestigious Queen’s Award in recognition for their hard work and dedication. 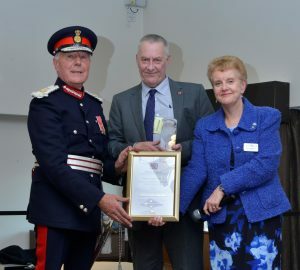 The team of volunteers who support the Black Country based charity were presented with the Queen’s Award for Voluntary Service by Lord Lieutenant of West Midlands, John Crabtree OBE, in a celebration event at Beacon’s HQ on Wolverhampton Road East. The award is the highest honour given to local volunteer groups – often referred to as the MBE for volunteers. Many volunteers joined the award ceremony as well as Beacon staff. Following speeches from the Lord Lieutenant, and Chair of Beacon Centre Trustees, Pauline Heffernan, the charity was presented with the award.